The other week I was reading Adam Beale’s fab blog ‘Five against one‘ rather than doing what I was supposed to be doing and yet again I found myself chastising myself for not going to #eltchat anymore (it’s actually the fault of doing CELTA at the times that the chat is held rather than of my own choosing), since Adam had blogged a summary of the latest chat, that just happened to be on one of my pet topics and favourite ways of teaching – guided discovery. ELTchat may not have answered my question or provided me with the plethora of examples I was hoping for, but it certainly highlighted the need for some further hands on research and investigation. Now, I may be looking in the wrong places or typing the wrong words into my search engine. So please tell me if you know of any great resources. I know that there must be research papers out there, but for teachers what we really need is examples and people writing or talking about their experiences with it. So if you do use Guided Discovery and have some ideas get them out there, blog them or put it out on twitter. And so my response is to share my latest foray into Guided Discovery world on Wednesday morning. I was teaching the CELTA TP students and being watched by my CELTA candidates – having to put my money where my mouth was since we’d had a session on conditionals the afternoon before where I had espoused Guided Discovery worksheets – time to show them the power of student-centred text-based step-by-step language clarification (i.e. Guided Discovery). The students anwered the questions about meaning alone, checked them with a partner and then we fed back on them. The main sticking point was the question ‘Is this staement real or unreal’, since they mostly saw it as real. I think I need to rephrase this question to something like ‘Is the speaker describing a situation in the real world or imagining an unreal situation in their head?’, although that seems too wordy to me. A little bit of elicitation and refining the context by asking this question helped me convince them the statement was unreal. And this elicitation of the fact that we’re talking about the past and we¡re talking about an unreal situation made eliciting the name of the structure to the top of the handout easy peasy – Unreal Past Conditions. 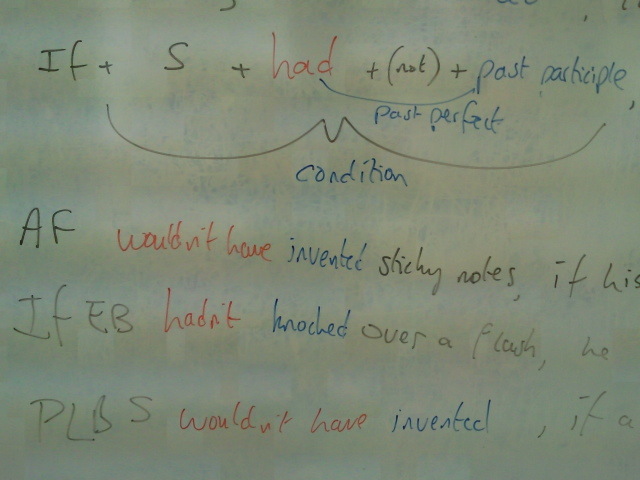 Then they completed the pronunciation section by themselves, in pairs and we fed back to the whiteboard. I did a bit more drilling to consolidate it with the written phonemes, which seemed to help them a bit and then they headed on to completing the form section by themselves which they found pretty straightforward. What really pleased me is they were able to come up with different possible modals for the result clause, they weren’t limited by the ‘third conditional’ misnomer to would, they quickly proferred could and might and may and must and should as well, although lots of credit must also go to K here who had brought out this point when guided discovering Unreal Present conditions on Monday. So they had been guided and they had discovered. Time to practice. Turn over the worksheet and consider the other inventions mentioned in the global text and discovered by accident. What would have happened if their accidents hadn’t happened. 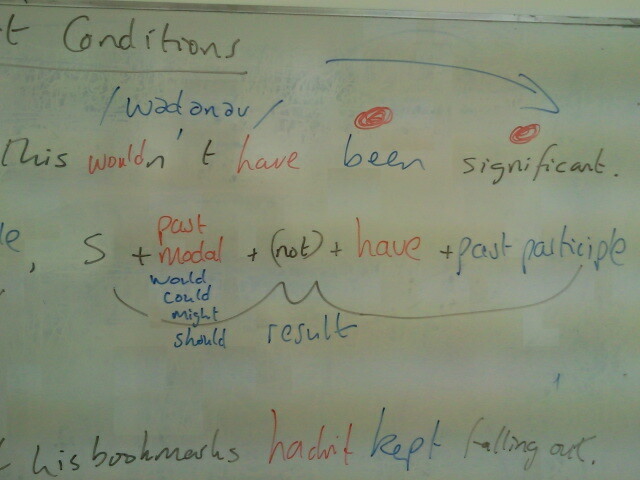 Off the students went to try and complete their own conditional sentences. It was a very challenging exercise since they had to go back to the text to remind themselves of the accidents that had led to the discoveries. But they were able to have a good go at it, although there were plenty of forms errors in their work. 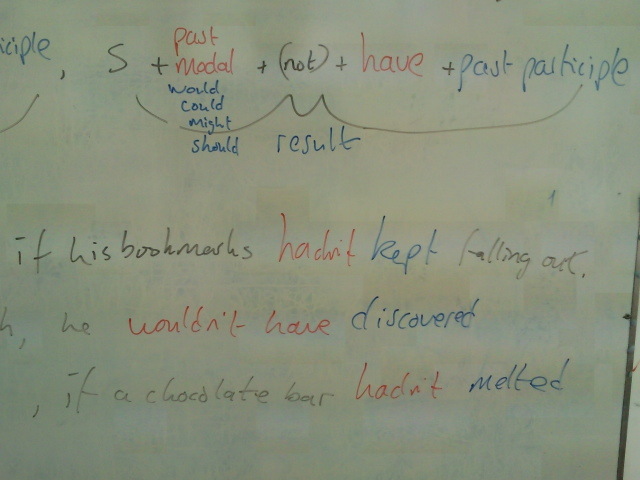 Have was being missed out regularly, one or two weren’t using past participles and one was using the past simple and so talking about the present. But with a few points back at my boardwork and the odd return to my CCQs – are we in the past? – they were able to self correct or at least peer correct when they got together to confirm answers. By the time they got to the group feedback they had the correct structures between them and I elicited them to the board (after some more focused drilling) to consolidate the structure for these very visual learners. Unfortunately the 40minute lesson was drawing to a close, so there was just time for a quick discussion of the inventions in Practice 2 and how things would have changed if they hadn’t been invented. Not surprisingly, some of them had unreal present results rather than past ones, but this was a good thing as they were able to form them correctly on the back of K’s Monday lesson and they were all happy to accept these as correct answers. No time for discussing the difference or for personalisation, but the practice activities will live to fight another day. If I’d had more time, I’d’ve done more personalisation. We’d’ve discussed real and unreal results of unreal past conditions, if the lesson had been longer. They’d’ve practised more freely and probably have made even more mistakes if we’d gone any further. But they wouldn’t have felt such a sense of achievement if they hadn’t discovered the rules for themselves. There was no accident about their discoveries. Hope that helps Adam and any other Guided Discovery newbies out there. Let us know how you get on if you try using the worksheet yourself or adapting it to another piece of language. Go discover! If you feel this is cheeky self-promotion, you can delete the link. Though I thought that, as Adam was complaining about lack of materials on Guided Discovery, the link would be useful. Other than that, I have not found specific research on Guided Discovery so it is indeed a good field to do research on. Most existing research touches upon the deductive/inductive dichotomy but not on Guided Discovery in particular. You asked me on Twitter how IWB and GD go together well I’ve been reflecting and here are my thoughts. I’ve been idly playing with interactive whiteboards for about 5 years now. But I have been a lover of GD throughout my teaching career. As you detail so wonderfully above, Guided Discovery helps students to work something out for themselves and gives them the satisfaction of doing so. One of the criticisms of the interactive whiteboard is that they make the class more frontal; a return to the chalk and talk. I’ve long held the belief that the IWB helps me with a grammar presentation for three reasons. 1. 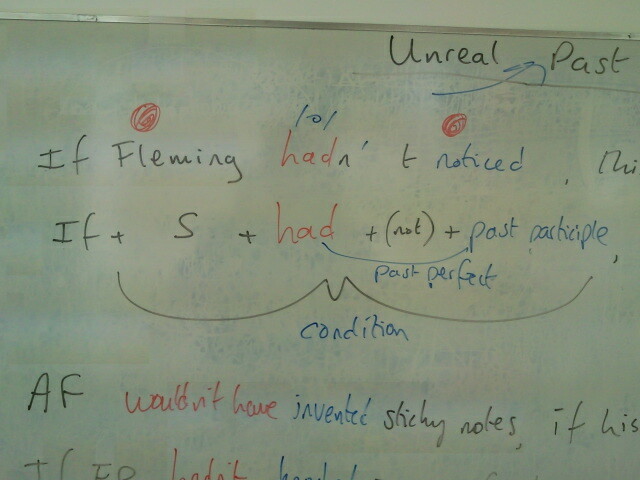 Clarity – the grammar table, timeline etc is clear on the board. 2 Saving classroom time – I can prepare this beforehand meaning in class I don’t have to. This means I can be out with my students, monitoring and helping, doing the guiding part of GD. 3 Revisitiability. It is easy to fill in answers and take them away again, it is easy to save and come back to in the next lesson or even later that lesson. Meaning we can revisit things and go back over things if students are unsure. I think in this demonstration, the visuals, the movement and the colours can help students remember the language point. Look forward to your comments.